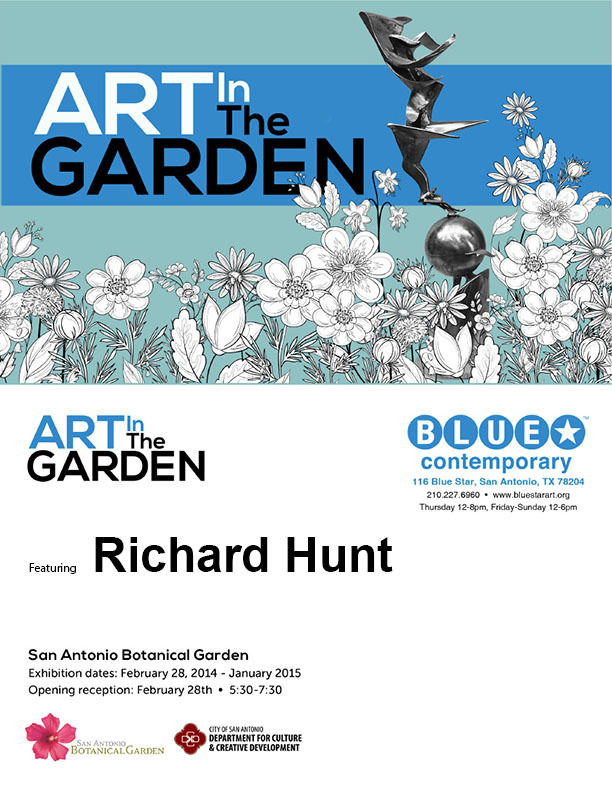 Once again, San Antonio Botanical Garden is host to Art in the Garden, an annual collaboration with Blue Star Contemporary. This year’s opening reception on Friday, February 28, 5:30pm – 7:30pm, features the sculpture of Richard Hunt and celebrates both the conclusion of Black History Month and the start of Contemporary Art Month. Mr. Hunt was born in 1935 in Chicago and educated at the Art Institute of Chicago. President Lyndon Johnson appointed him as one of the first artists to serve on the governing board of the National Endowment for the Arts. He also served on the board of the Smithsonian Institution. In 2009, he received the Lifetime Achievement Award from the International Sculpture Center. Mr. Hunt’s huge studio was formerly a Chicago Transit Authority Electric Substation, adequately equipped for fabricating his small to large-scale sculpture. Incorporating these creative pieces into the Garden landscape offers visitors a unique look at and experience with abstract expressionist sculpture. As part of the San Antonio Botanical Garden’s “Cultivate Yourself” message, both young and mature guests are able to appreciate the creativity of man and the beauty of nature. Admission on opening night is free and a cash bar is available. The exhibit will remain on display through January 2015. San Antonio Botanical Garden would like to thank the Russell Hill Rogers Fund for the Arts for sponsoring this year’s exhibit. Daily admission to the San Antonio Botanical Garden is $10 adults; $8 students, seniors, military; $7 children age 3-13. San Antonio Botanical Garden is located at 555 Funston Place at North New Braunfels. Parking is free. The Botanical Garden is operated under the auspices of the City of San Antonio Department of Parks & Recreation and is open year-round except Thanksgiving, Christmas and New Year’s Day. For more information, visit www.sabot.org or call 210-207-3250.